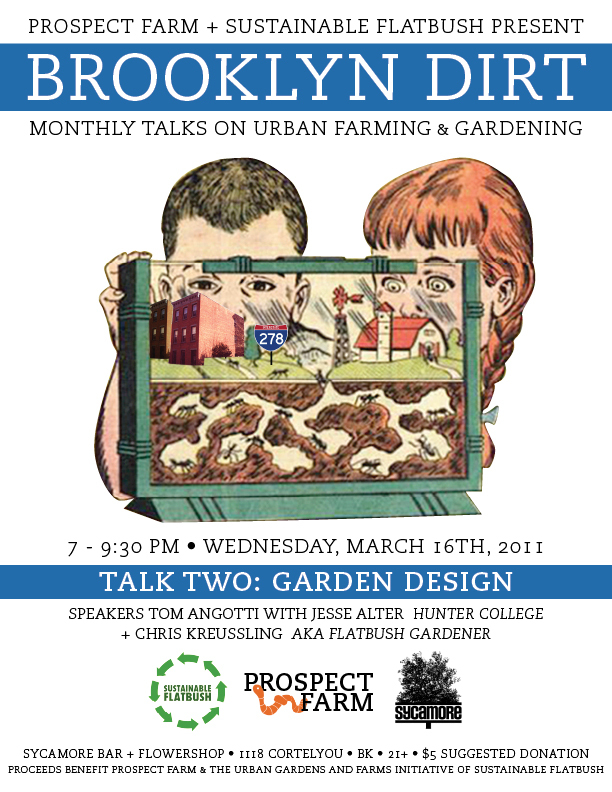 On Wednesday, March 16, Prospect Farm and Sustainable Flatbush are proud to present Brooklyn Dirt: Monthly Talks on Urban Farming and Gardening. Chris Kreussling (aka Flatbush Gardener) is a garden coach with more than 30 years gardening experience in NYC. Chris is also the Director of the Urban Gardens and Farms initiative of Sustainable Flatbush and a community member of the Healthy Soils, Healthy Communities advisory board, a project of the Cornell Waste Management Institute. Sustainable Flatbush brings neighbors together to mobilize, educate, and advocate for sustainable living in their Brooklyn neighborhood and beyond. Prospect Farm is a community group in Windsor Terrace, Brooklyn that is working together to grow food in a formerly vacant lot, with the mission toward creating a Community Supported Agriculture (CSA) Farm that can serve our community. Prospect Farm is the community leader for the Kensington/Windsor Terrace neighborhood group for the Brooklyn Food Coalition.